“Why Should We Have To Buy Our Own Things Back? 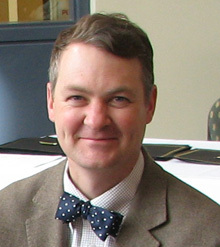 The Struggle Over The Spalding-Allen Collection” is the title of Trevor Bond’s dissertation he defended on February 14, 2017. Dr. Bond’s dissertation abstract can be found here. Dr. Trevor James Bond is the Co-Director of the Center for Digital Scholarship and Curation, Associate Dean for Digital Initiatives and Special Collections at the Washington State University Libraries. Bond received his Master’s in Library and Information Science (MLIS, 1998) with a specialization in Archives and Preservation Management and a Masters in Ancient History (MA, 1994) at UCLA. In 2009, he was promoted to the rank of Librarian IV/Professor.